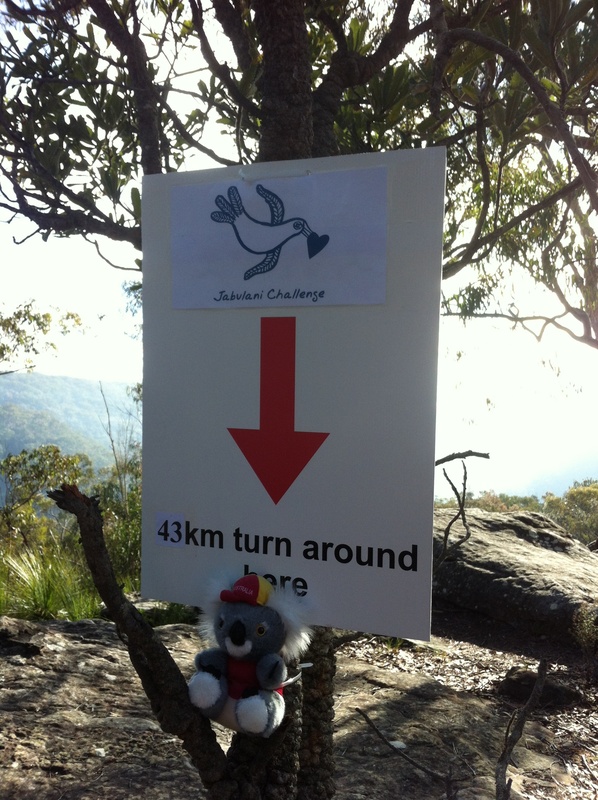 The Jabulani Challenge took place today in Ku-rin-gai Chase national park, around Bobbin Head in North Sydney. It was my 3rd marthon this month. ( Gold Coast 3 weeks ago, Hunter Valley 1 week ago). 43 km of trails on tired legs was never going to be easy. My alarm sounded at 5am, and I really didn’t want to eat breakfast at all. I’m starting to get sick of carbs! I struggled to eat a muffin and a banana as I drove to the start line, where I met up with Pip Cave, who was also running the event. Turns out we were dressed nearly identically, which probably isn’t hard, considering we both own a lot of the same lulu running gear. I registered when we got there, with the help of a loan from the Bank of Pip. ( Forgot my cards/cash – oops!). I was surprised at the number of people registering on the day for this event. A 43k event is usually something you plan a little bit in advance. I would also like to point out that the eventual winner also entered on race morning. We were underway at 7.15am, and the race was pretty tough from the start- straight into single track, before the field of around 75 had been broken up. I tried to stick with Pip, but it was not too far before we got separated on the narrow, undulating trails. It was about 6km in when I came to the first steep uphill section- lots of stairs. Time to walk. My glutes were burning already. This was going to be a long day. 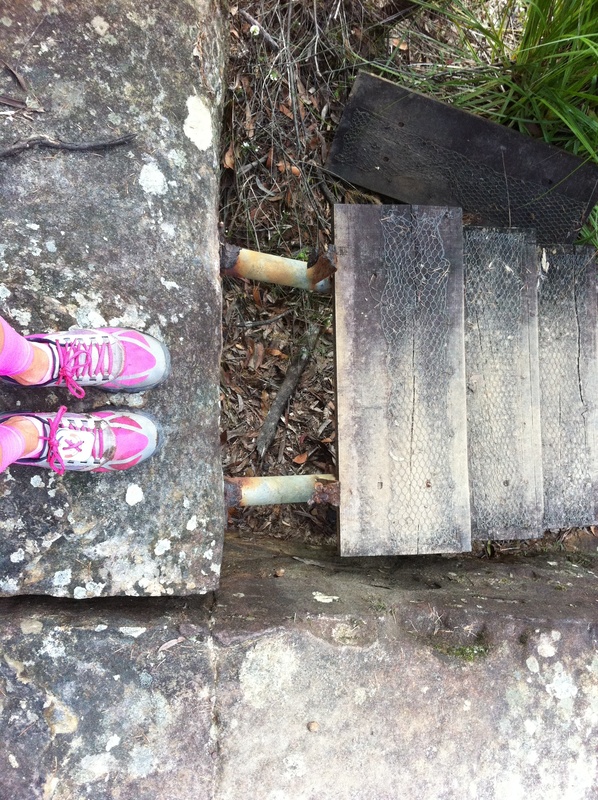 The stairs bought me up to a road, and the first aid station. Time for a cup of water, and my favourite… Green snakes! I turned back into the bush, and met a steep downhill stretch, followed by a steep uphill section. At the 10k mark, it was time for my second salt tablet. I pulled them out of my fuel belt, only to drop them all over the ground thanks to a hole in the bag. No! I hoped today was not the day cramps would choose to strike. I was not about to stop and fish them out of the sandy dirt. I found myself running with a guy named Alexis ( I remembered to ask this time!) He had done quite a few ultras and trail marathons before. We ended up running about 15km together. Chatting always makes the run go quicker. I stopped to fill my drink bottles at the next water station, and cheered on the race leader who was on his way back. I then entered a loop towards the first turnaround point. I enjoyed this section because we got to run past others who were ahead of us on the course. I passed Pip, who was on her return journey, running with another girl. By my calculations, they were in 3rd and 4th place. This part of the race we were on fire trails, but soon turned on to a path that led up to a road, and back onto single track. Down down we went, down a lot of stairs, to a river crossing, and then came the up section. It was pretty steep and rocky. This kilometre took me about 15 minutes, but then it was back onto the fire trails again. Alexis and I came to an unmanned water station, filled bottles, and headed out onto a road that would take us to the second out and back section of the course. Here we passed the race leader again, who was a long way in front this time. Shortly after that, Alexis and I were separated, and I was back to running on my own again. The next stretch had some steep uphill and downhill sections, some of which were concreted. I started to look forward to the uphill sections – walk breaks! My legs were burning, heavy and fatigued, but my energy levels were good, thanks to a constant supply of GU, gatorade and perpetuem. I passed the lead female on her return journey, she was a long way in front too. Eventally, I came to the 30km mark, where I had my name marked off. It seemed that Pip had been there already, telling stories about me. As I came into the station, the volunteer said ” you must be the girl who has backed up from Hunter Valley last week”. Soon enough, my garmin beeped to signify 33km completed. Yay, only 10 to go! The trail looped around to come back the way I had came, and I ended up back at the unmanned station. I stopped here for a few minutes to make sure I was going the right way. No one else came along, so I pulled out my phone to check online. Yes, I was on the right track. At around the 38km mark, i accidentally took a wrong turn and ended up off course. I climbed a steep incline, thinking it was the right thing to do. At the top, I saw a row of route makers n both directions, and realised I had made a wrong turn. Not sure which way I was supposed to be coming from and which way I was headed, I decided to wait for the next runner to come along. 10 minutes later, there was still no sign of anyone. I texted Pip, who I hoped was finished by then.. She suggested I try Google maps. 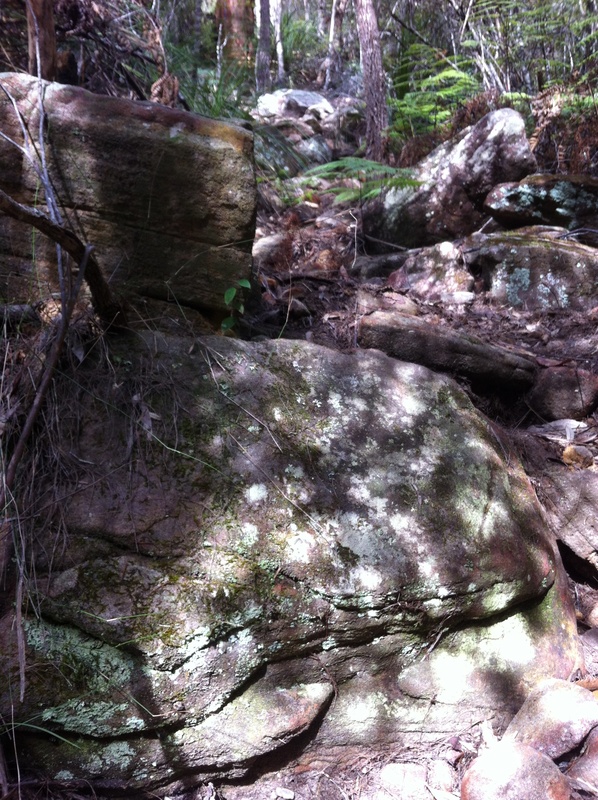 Turns out, I was up on the sphinx trail… Not where I was supposed to be! An extra 2km added and over 20 min wasted waiting for other runners who were not coming and looking at maps. Eventually I was back on the right track. My adrenaline was pumping, fuelling me for the last few km. I came up behind Alexis again, who was surprised to see me, thinkng I was up ahead of him. I passed him, and really enjoyed the last couple of kilometres of single track. With about 500m to go, I spotted Pip in the bush up ahead. Wow, fluro pink is really visible from a distance. She told me not far now, and I crossed the last bridge, and ran around to the finish line. I completed the course in 5:49:29, as the 8th female. Pretty good, considering my detour and my lead-up. I was so happy to hear that Pip had placed 9th overall, and 2nd female, in a time of 4:57:50. Big congratulations Pip, that is so awesome! There were sausage sandwiches, cakes, fruit, soft drinks and nutella at the finh line, but I did not feel like any more food at all. Slightly disappointed that we had just paid $130 and run 43km and did not even get a medal (not even for a podium finish), Pip and I decided to stop in at Lululemon on the way home to pick up some bright new athletic wear to celebrate our success.